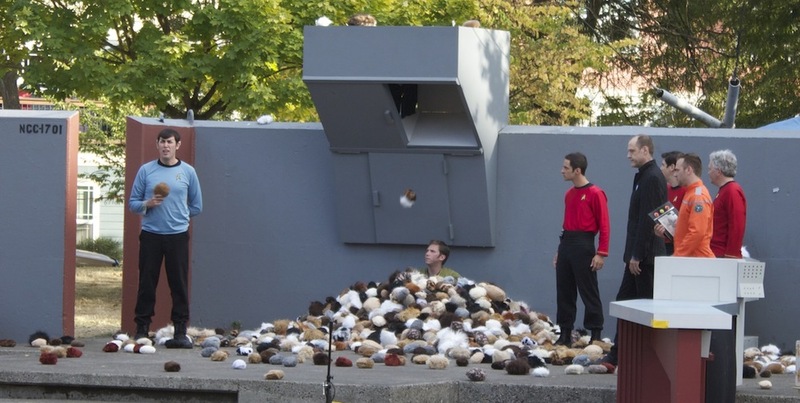 This is the fifth and final year of Trek in the Park, an annual live re-enactment of an episode of the original Star Trek show put on by Atomic Arts. It started out small with a few people having a good time over a lark. It has become massive, moving from a cramped corner of a small park to a vaster space in a larger park, but STILL packing 'em in. Attendance is easily in the thousands now. 2013: "The Trouble With Tribbles"
The comedy climax, Kirk piled on with Tribbles. As on the original show, throughout Kirk's dialog he gets bonked by descending Tribbles. Vulcan ear sets aside an area for those wanting an easy view of the provided American Sign Language interpreters. While there are wry laughs to be had, it's a communal vibe with a great fondness for the material by both audience and crew. Over the last five years, the audience has palpable warmth toward the developing and ambitious Atomic Arts group. Trek in the Park is worth checking out in clips on YouTube. It's across the internet and has been featured in a Portlandia skit. At the end of this year, Adam Rosko (who plays Kirk and started Trek in the Park with his sister) said that Atomic Arts would be performing on its own original work. He emphasized the importance of ending things on a high note, and while they were still fun and within control. Atomic Arts has done that. Keeping eyes open for their next project will be worthwhile.